While both Dermalinfusion and Microdermabrasion remove a portion of the upper layer of the skin, or the stratum corneum, the Dermalinfusion treatment is much more controlled and consistent in the way it operates. 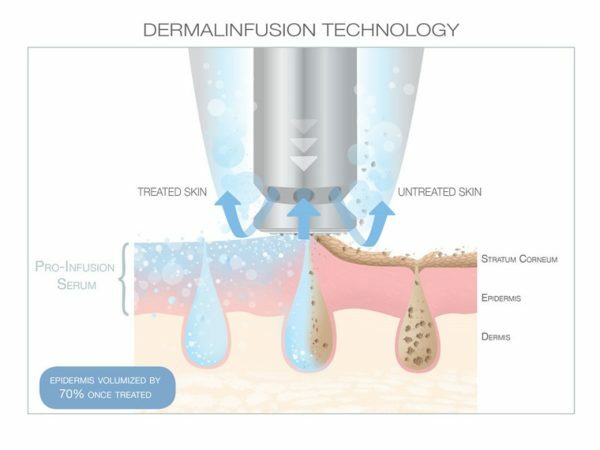 Rather than blasting particles of skin (as with older microdermabrasion devices), or pushing an abrasive tip across the skin by hand, Dermalinfusion uses the controlled vacuum pressure to pull the skin up into a chamber in the hand piece, where it is evenly abraded just as aggressively or as softly as the vacuum pressure is set by the skincare professional. All other devices rely on the operator to apply the same pressure, at the same speed to achieve the goal of consistent results. Our esthetician will meet with you and determine a plan perfectly fit for your skin.